We are recruiting now for the most sought after marathon ticket in the world! The Virgin Money London Marathon has grown to become one of the most popular and largest annual fundraising events in the world. 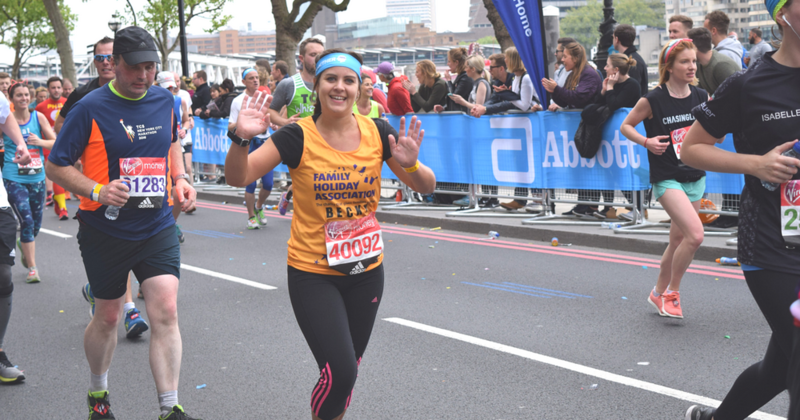 The course follows the famous route taking in many of our capital’s landmarks, such as Tower Bridge, the Cutty Sark and The Mall. An iconic event that’s high on everybody’s bucket list, we are now accepting applications – so apply to be part of Team Starfish today! How do I sign up for the Virgin Money London Marathon 2020? To apply for a place in the 2020 event simply complete our online booking form. If you have any queries please email Michelle@FamilyHolidayAssociation.org.uk. We ask each participant for a £100 registration fee* and to raise a minimum sponsorship of £2,000. Why run the Virgin Money London Marathon for the Family Holiday Association? You will be raising money to help struggling families benefit from a much-needed break. For many, it will be the first time they have ever spent time away from home, seen the sea or played in the sand.